Oil with the extract of black cumin has been designed by the Kardashian sisters for Farouk, a well–known and appreciated company in the United States. The brand has gained its popularity thanks to effective and professional products, trusted by a large number of women and men. All cosmetics promoted by this brand quickly conquered the whole world. 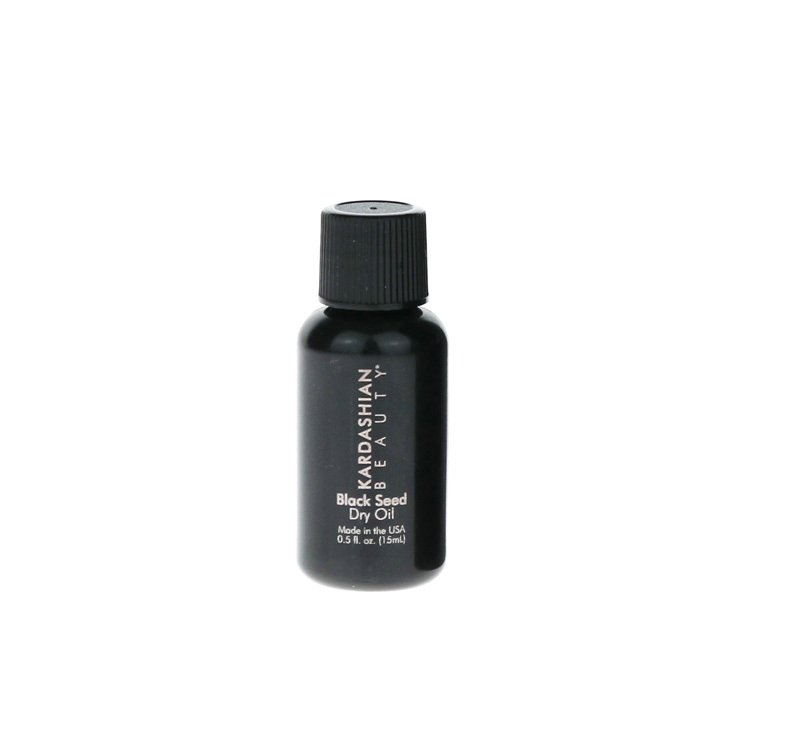 Oil comes in a small (only 15 ml), black, plastic bottle. It has a typical oriental smell of cumin. The content of the product is an oil extracted from small, black seeds. Black cumin seed oil (Oleum Nigellae Sativae) is known for centuries and willingly used in medicine. It can also be called the “Gold of the Pharaohs.” Today, numerous studies confirm its phenomenal effects and prove that it supports the fight for beautiful hair. The oil contains a high concentration of unsaturated fatty acids – linoleic acid, oleic acid, alpha-linolenic acid. Also rich in vitamin E, beta-carotene, sterols, biotin, microelements and a number of antioxidants. It is, therefore, a kind of elixir of youth that regenerates and rejuvenates hair and influences processes occurring inside the cells. Locks are bouncy, glossy and sleek. The oil also stimulates hair growth and nourishes the ends. The oil from the “Kardashian sisters “ contains a lot of volatile silicones, and a high amount of this precious oil. Additionally, it is enriched with silk proteins that smooth and moisturise hair, and provide softness and elasticity. Natural silk supports the regeneration of hair and closes the scales. Kardashian Beauty Black Seed Oil has a light texture, is absorbed quickly and is efficient – one drop is enough for daily hair care. The content of the bottle will certainly last a little bit longer than one month. It will not make your hair greasy and it is easy to distribute. Unfortunately, apart from the silicones, it also consist of harmful, clogging the hair fibre mineral oils that interfere with beneficial substances. The small bottle is very handy, can fit in a small purse, pocket, make-up bag and it would be great to take for holiday. However, its black colour makes it impossible to see how much of the cosmetic has already been gone. Oil is suitable for all hair types and a great addition to your regular daily care. At the same time it will be a remedy for extremely dry, frizzy and unruly hair. It will also solve the problem of splitting ends. Rub in your hands a small drop of oil and massage into dry or wet hair. It can also be applied to the hair ends. the bottle is dark and it is not visible how much oil has already been used.